Many of you may have heard of Abraham Maslow’s hierarchy of needs. And for those of you who have not, briefly, Maslow was a humanistic psychologist who is most known for his theory of Self Actualization. The idea is that individuals are driven, or motivated, to fulfill unmet needs (see figure below for descriptions). We start at the bottom and once that level of need is met, motivation dwindles, and we move up to the next stratum of needs. The last stratum is Self Actualization (although Maslow in his later years did add Self Transcendence as a final stratum). According to Maslow, very few people reach Self Actualization. Personally, I hesitate to ascribe to the belief that all people move through all stages of all psychological models in the same way. I honor that people are more complex than that. That being said, I’d like to speak to the third stratum – Belonging and Love needs. It seems that this need is quite important. I noticed this year while working in the college settings, in private practice and doing community outreach that the need to feel that one belongs somewhere or to something is quite important. No matter who you are: married, professional, immigrant, wealthy, person of color, lesbian, blind, veteran, athlete, adolescent, etc… everyone struggles with wanting to belong. I hear people complain that they are lonely in their romantic relationships, lonely in their workplace, with their family, at school… the possibilities are endless. I spoke with a fellow therapist who shared the idea that Belonging and Love needs are almost as important as physiological needs and could be moved down to the first stratum. Indeed for some, lacking a sense of love and belonging can be painful and emotional pain/discomfort can lead to maladaptive thoughts and behaviors. For some, it may mean using alcohol or drugs to numb out the angst or withdrawing from friends and family. For others, it may mean mistreating people or sabotaging relationships, intentionally or unintentionally. The human mind is capable of infinite self deceptions. This is why reflection is important. Life is busy. We have to survive and take care of our responsibilities. We do what we have to do to meet our needs and those of our loved ones. 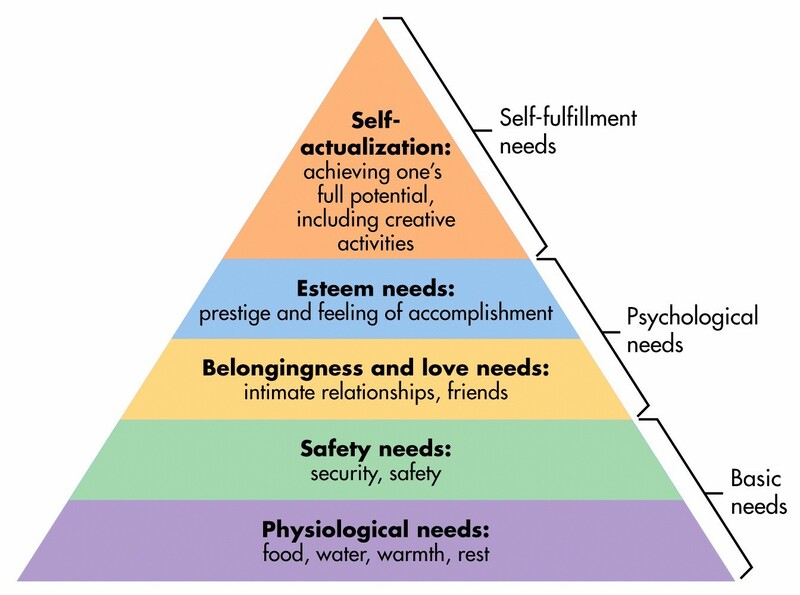 However, if you were to reflect on your own hierarchy of needs, which of your needs are not being met? In what ways do you cultivate your need to belong and feel loved? How does your present environment create space to invite love? Do you behave in ways that create inclusion or exclusion in your life? What are some things you would change? What do you have to do to make those changes?